The stage was all set. All the hard work and wonderful display of cricketing skills by the Engineers, throughout the season of 2015, finally boiled down to this one match: the final of Kanto Cricket League (KCL-2015). It was a ‘clash of the titans’ between Indian Engineers and Samurai, the best two teams of the tournament. Riding on the back of an awe-inspiring performance in the semifinal against Alpha Q, the Engineers were all set to lift the coveted trophy in their maiden final appearance. They also had a very strong team consisting of batsmen, bowlers and several all-rounders (importantly majority of them in form) at their disposal. On the other side, Samurai was also ready to avenge the loss they suffered against the same opposition at the group stage. They were high on confidence after demolishing Indian Tigers in the semifinal. After the tussle over neutral umpire in their group match, the final had two neutral umpires. Among all the brights, the only dark point was the weather: a persistent and strong wind of 20-30 km/hr was threatening to blow everything away. However, the match started as scheduled. Skipper Vinay won the toss and decided to put the opposition to bat first. The start was not as engineers would have liked: a wide down the leg-side by the Engineers’ most consistent bowler Rajneesh eluded the keeper to the boundary. It was just the beginning but it somehow reminded this writer about the World cup final-2003 between India and Australia, when Sourav Ganguly elected to field first and Zaheer Khan bowled a wayward first over including a wide that went for four runs. However, Rajneesh was quick to correct his line. Samurai opener Ishara showed his intents very early by dispatching the third ball he faced for four. The first over yielded 10 runs (better than 15 runs by Zaheer!). After keeping quiet for four balls in the second over, bowled by Biju, Ishara launched one straight over the bowlers head for six. The other opener Hanif, the tormentor of Indian Tigers in the semifinal, was also in the mood of taking game away from engineers early. He hit two fours of Rajneesh in the next over taking Samurai to 27/0 after 3 overs. In Biju’s second over, Hanif hit straight into the hands of mid-on where Ashok made an easy sitter looked difficult before grassing it. A couple of balls later Biju had his hands in the head again. This time Rajneesh messed up the catch offered by the other opener, Ishara. To make amends for his missed chance, Rajneesh scalped Hanif in the very next over thanks to stunning catch by Sumon at gully (35/1). The fall of wicket also stopped the run flow to some extent. Both Rajneesh and Biju bowled at good length on off-stamp line. While Samurai no.3 Thirimanne concentrated on singles, Ishara could not rotate the stike and relied on occasional expansive shots. The bowling change in the 9th over worked for the Engineers when Anurag accounted for Ishara (23). After surviving a strong appeal for caught behind, Ishara tried to smack the very next ball out of the ground over the bowler’s head but only managing to nick it to the keeper. This time the umpire had no doubt. At the end of 10 overs the score read 54/2. The game was well balanced, with the Engineers new ball bowlers did very well to manage the ball in the strong wind. Samurai no.3 Thirimanne and no.4 Suppun played very well from here, building a match defining partnership of 85 runs in 15 overs. They survived a probing spell by Anurag and a mixed caution-aggression approach to take their team to 100 in the 18th over and then to 114/2 midway (20 overs). Engineers broke the threatening partnership when Dinesh trapped Thirimanne in front of the stamps in the 25th over. By then he already scored a half century (Thirimanne, 54) and Samurai (134/3) was well set for the final assault. 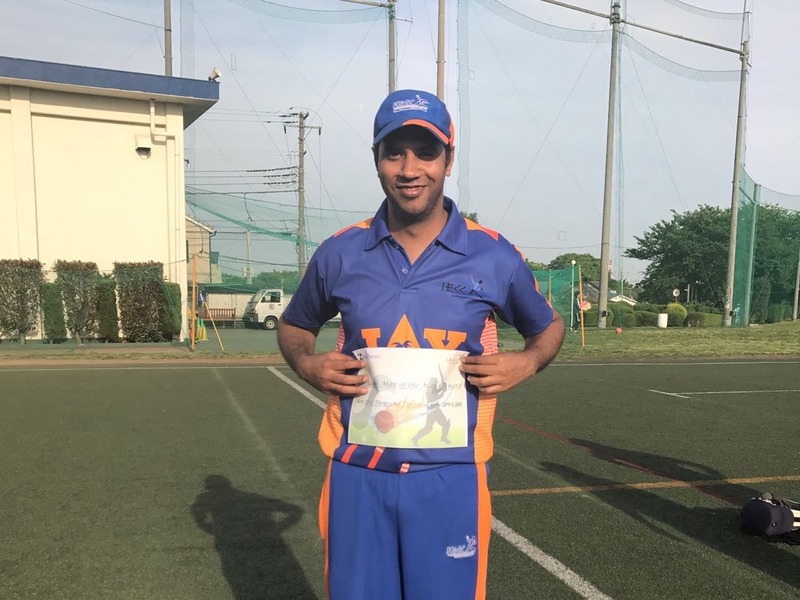 However, Samurai captain Chula with well set Suppun at the crease could not just break free thanks to some good bowling effort by the Engineers. Particularly Vinay was economic, conceding just 13 runs in his first five overs. However, the breakthrough belonged to Rajneesh who disrupted the timbers of Chula (8), trying to break the shackles (184/4, 32 overs). The new batsmen could not score much and wickets kept falling at regular intervals (202/5,204/6, 217/7,228/8). However, Suppun, well set by then used the wind to good effect. He played his big shots along the direction of the wind, picking up 14 in an over of Vinay and 22 in the final over by Manvi. 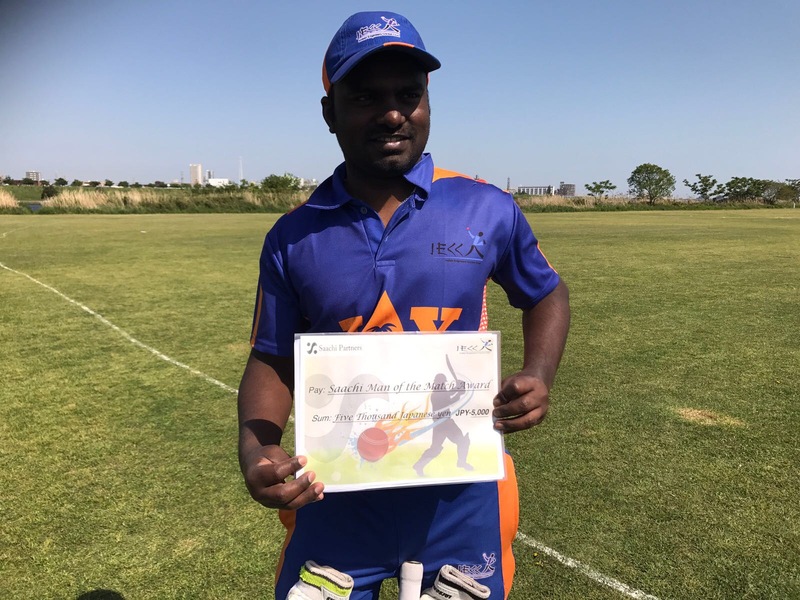 With a six of the final ball he also reached to his century (104*) and took Samurai to a formidable 249 in stipulated 40 overs. Samurai accumulated 65 runs of the last 8 overs. Overall, engineers’ bowlers did very well in the unfair weather, particularly after Samurai got off to a flying start. Rajneesh, Anurag and Vinay picked up two wickets each while Dinesh accounted for one. Manvi got the maximum smacking (7-0-58-0). A couple of dropped catches also did not help the Engineers, but otherwise the fielding was not too bad. Sumon was particularly brilliant in the gully area, and later with keeping gloves in the hands in effecting a stamping and a run out. Midway through the match it was not all over for the engineers. Although the target (250) was more than run a ball, with a very strong batting line up and a small ground at disposal, Engineer’s were confident of chasing it down. They knew if they can play full 40 overs the match will be theirs. With this belief engineers’ went to have the mouth watering Chicken korma, prepared by PK, and bread for lunch. By then more supporters and sponsors of Team IECC had also reached the ground to cheer. With skipper captain Vinay deciding to bat in the middle order, Rajneesh was promoted to open along with Prashant Kale. They played the first over with caution scoring only 4 runs off it. In the next over a misunderstanding between the openers cost the Engineers their first wicket. Rajneesh played a ball towards square leg and set off for a single. However, Kale’s refusal was a bit late for Rajneesh to come back to the crease. The umpire ruled the close call for run out in favor of the fielding team, although the batsman felt he was home. Engineers were reduced to 6/1. Dinesh joined Kale next. While Samurai opening bowlers Ashiq and Uddika bowled tight line, Dinesh and Kale played with caution. Kale also got a reprieve in the 4th over when his catch was dropped in the mid wicket region. He tried to relieve some pressure by greeting Samurai captain Chula with a four of the first ball and a six of the fourth in the 7th over. However, their partnership did not last enough and the Engineers lost another wicket to run out. This time Dinesh tried to a play a big shot in the final over of power-play, but only offered a high catch to point. The fielder failed to hold onto the catch in the strong wind. But Dinesh, while watching his reprieve, was late to respond to Kale’s call for a run and was run out in the process (IECC: 29/2, 7.3 overs). Now Saif joined Kale, who continued to bat positively. The bowing change worked for Samurai when the introduced Hanif in the 10th over. Kale smacked a four of the fifth ball of Hanif, but perished in the process of hitting the next ball out of the ground by offering a catch to long on (Kale: 30). The Engineers were once again facing similar situation as in the semifinal: 45/3 in 10 overs in a stiff run chase. They needed once more a strong display from their middle order. They had heroes of previous match, namely Anurag, Sumon and Manvi along with Captain Vinay, Ashoke and PK to see them through. Vinay came in at no.5 to join Saif. However, Vinay a got an early beauty from the opposition number, Chula, that kept rising from short of good length and took a thin edge through to the keeper (IECC 45/4). The jubilant celebration of Samurai showed the importance of the wicket. While next batsman Sumon played cautiously, Saif decided to take the attack to the opposition. He quickly scored 22 of 14 balls, but got out in the process of hitting one too many. After hitting a six of Samurai spinner Thirimanne, he tried to smack the next one also out of the park. But this time the shot against the strong wind only reached the waiting hands of long off. It was bit unlucky; had it been with the wind it would have easily cleared the ropes. Now IECC was in serious trouble with 71/5 in the 15th over. With Anurag joining Sumon in the middle, all IECCeans were hoping for a repeat of semifinal feat from them. However, that was not to happen on this day. In his next over, Thirimanne trapped Sumon in front of the wickets to reduce the Engineers to 79/6. Manvi and Anurag played safely and took the score to 100 in the 23rd over. However, Manvi was trapped LBW in the same over, once again by Thirimanne (IECC, 100/7). Anurag, playing out singles till then, decied to open up against Samurai spinner Sujith hitting him thee fours in an over. He and Ashoke quickly accumulated 29 runs in three overs. Once again when the Engineers camp was seeing some ray of hope, they were again undone by another misunderstanding resulting in the wicket of Anurag. Just similar to Rajneesh’s shot in the beginning, Ashok played a shot to square leg. This time non-striker Anurag quickly set off for a risky single and reached the danger end, while Ashok stood the ground. Both ended up at the striker’s end and Anurag had to depart (IECC 129/8, Anurag 24). Samural put the final kneel in the coffin in the next over when Ashiq uprooted the stumps of PK of the very first ball he faced (IECC 130/9). Ashok managed a few more runs in the company of last man Biju, but that was never going to be enough. Finally Ashok was stumped off Chula for 11 and the Engineers were bundled out for 143 in the 29th over. For Samurai Thirimanne was pick of the bowlers picking up 3 for 27 in 5 overs. Chula took two wickets, while Hanif and Ashiq took one each. But IECC did not help themselves with three crucial run outs in the final. 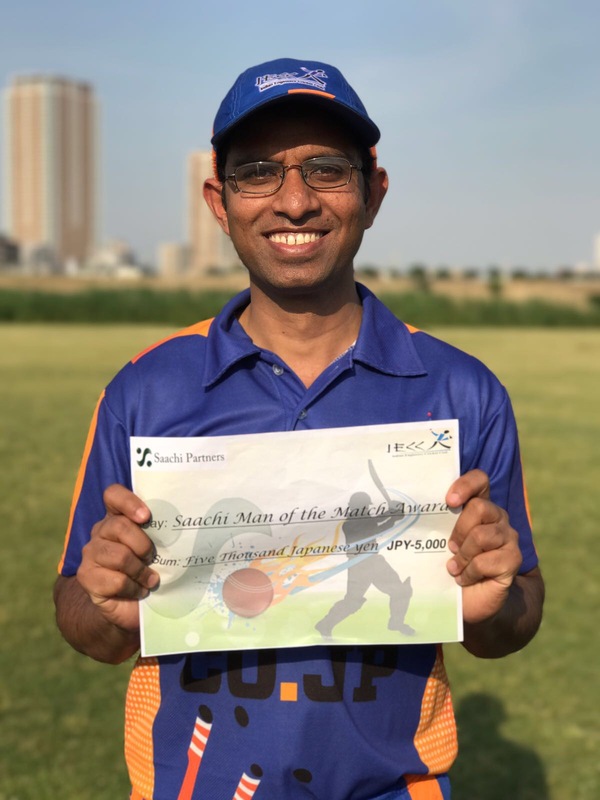 Samurai keeper Suppun was their man of the SIDO match with a superb century. For the Engineers, Anurag was the top performer with two wickets and a spirited 24 with the bat. Although the Engineers could not win the final battle, they fought it hard in the challenging weather and they should take pride in their performance throughout the tournament, specially the semifinal match. They did enjoy the moment and did some post match analysis over a barbecue party in the ground, arranged by Biju. 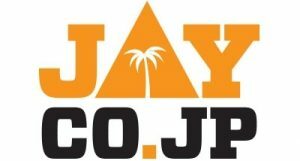 This brings curtains to the 2015 season where Team IECC fared rather well with semifinal appearance in the Japan cup T-20 and finalist here in KCL-2015. However, they have one more chance to clinch a trophy this year. The final 2014 KCL was postponed to this year and scheduled to be played on 15th Nov against the Indian Tigers. After Semifinal and final appearance is it time for the trophy? Lets’ all hope so.